Transition between two clips using animated lightning bolts. The clips dissolve into each other, while the lightning grows. The Dissolve Amount parameter should be animated to control the transition speed. 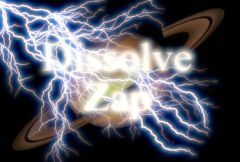 Dissolve Speed: Default: 5, Range: 1 or greater. The speed of the dissolve between the From and To clips. When set to 1, the dissolve takes place over the entire duration of the effect. When set higher, the dissolve is shorter, although the lightning bolts still change size and brightness over the entire duration. Setting this to 10 can make the transition snappier and more like a flash-frame cut. Max Bolts: Integer, Default: 35, Range: 1 to 500. The maximum number of lightning bolts at the midpoint of the transition. End: X & Y, Default: screen center. The end point of the bolts. Vary Endpoint: Default: 1.4, Range: 0 or greater. Offsets the End location by a random amount within a circle of this radius. If Max Bolts is greater than 1, this can be useful to spread out the different End points. Bolt Width: Default: 0.11, Range: 0 or greater. Branchiness: Default: 5, Range: 0 to 20. Zap Glow Bright: Default: 2, Range: 0 or greater. Zap Glow Color: Default rgb: [0.5 0.5 1]. Zap Glow Width: Default: 0.224, Range: 0 or greater. Bg Glow Bright: Default: 8, Range: 0 or greater. Scales the brightness of the background glow at the midpoint of the transition. Bg Glow Color: Default rgb: [1 1 1]. Scales of the color of the background glow at the midpoint of the transition. The colors and brighness of the glow is also affected by the inputs. Bg Glow Width: Default: 0.4, Range: 0 or greater. Scales the background glow distance at the midpoint of the transition. Note that a zero glow width still enhances bright areas; set the brightness parameter to zero if you want no background glow. Rand Seed: Default: 0, Range: 0 or greater.